The first Heavy Media Separation (HMS) plant commissioned in July 2008 by Chemaf is located at Etoile mine. It was designed by Bateman Engineering to concentrate the copper and cobalt from an as mined ore to an enriched ore feed. The HMS process uses a suspension of ferrosilicon in water (dense media), the suspension is maintained at a pre-determined specific gravity. Once the crushed ore is introduced to it, it then either floats or sinks depending on its specific gravity. The enriched ore sinks and is recovered as ore concentrate and the tailings will float. HMS 1 plant has the capacity to treat 100 tonnes of ore per hour (tph). In 2009 the Company commenced construction with DRA (a South African specialist manufacturer) of a second HMS plant at Etoile mine called HMS II which has been commissioned in August 2010. This is a sophisticated plant that also uses dense media. It recovers partically fine material by using banks of spirals. This plant has ore feed at the rate of 335tph and HMS feed of 200tph with additional spiral to handle 100tph feed. Originally, the HMS plants were operated in parallel, with their concentrates being combined for leaching at Usoke and their rejects being combined for storage for future treatment. In August 2012, the plants were reconfigured to run in series with expected improvements to both recoveries and grades. 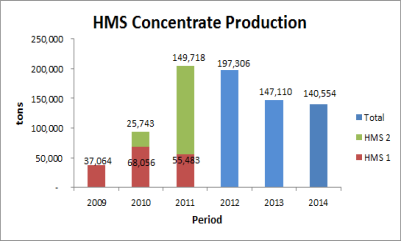 In 2014,HMS I and II running in series produced 140,554 tonnes of concentrate at grades of 5.23% Cu and 0.69% Co.With this reconfiguration, we were able to limit dolomatic feed to usoke and resulting in lower acid consumption for copper and cobalt leaching.